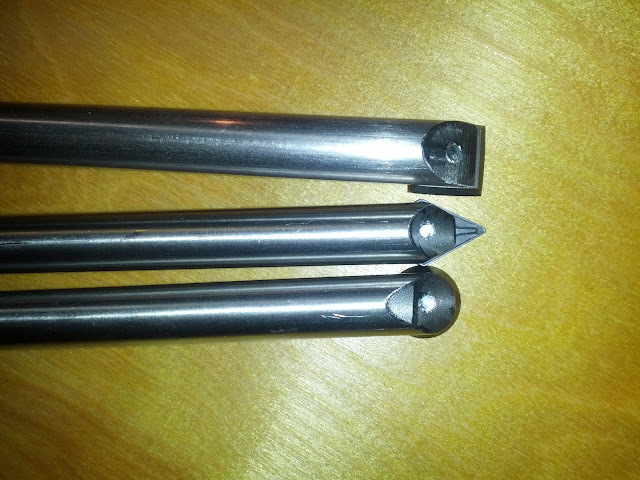 with the spreading acceptance of carbide turning tools, I decided to jump on that wagon and make some and give it a try to see how it compares with HSS tools. I have no problems grinding and sharpening tools, so being able to make my own tools on the cheap was the big drive here. Diamond – for detailing and access to tight areas. 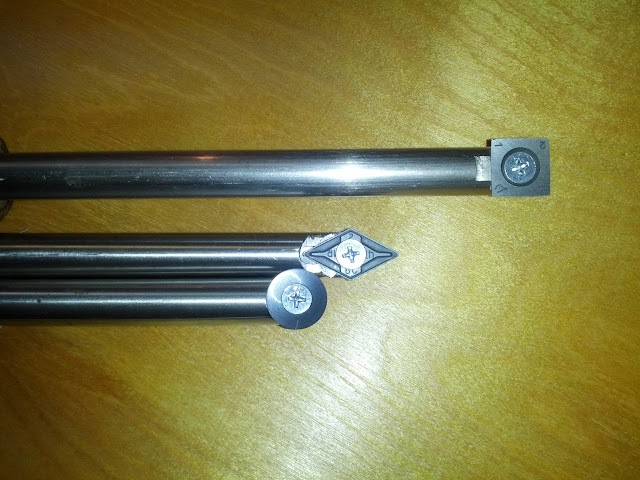 For now this will be friction fit, and if it works well, I’ll epoxy the stainless steel shafts into the handles. Next, I’ll be running some test cuts on an upcoming project to see how they behave (father and daughter nutcracker build) and will report with findings. Very nice work. 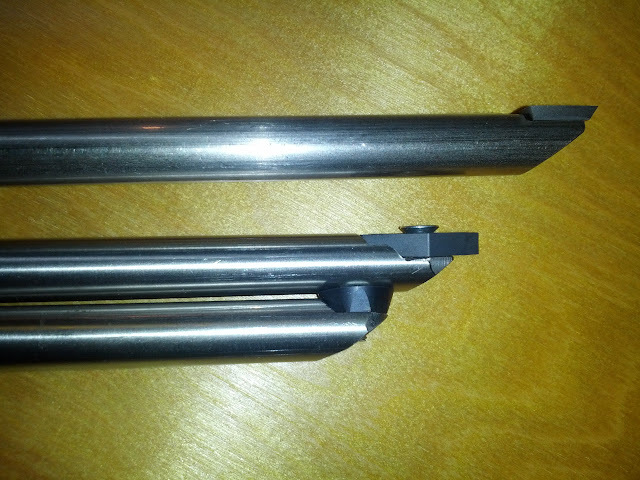 Your machining on the bars looks very clean. I made a similar tool myself (just for the round cutter): http://lumberjocks.com/projects/84210 . How you undercut the bars is clever, mine is sometimes tricky to use on small-diameter bowls due to the height of the bar+cutter. 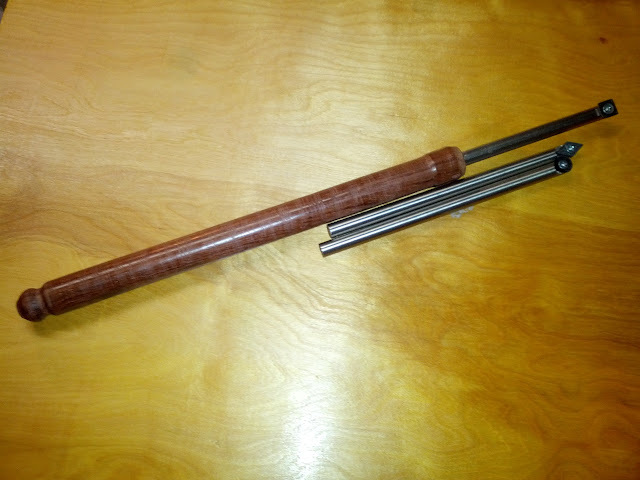 I think your tool handle might split without a ferrule, as there’s a lot of torquing motion on a giant lever arm into the endgrain… might want to consider getting some brass or copper tubing and epoxying it onto the end. Also, where did you buy the carbide cutters? Mine is a sorby model from woodcraft, though I think the easy tools cutters might be better. Excellent job, Sharon. I envy your metalworking abilities. I really like working with carbide cutters. The purist in me says I should practice with all my chisel profiles, but it’s just so easy to turn to one of the carbides. I do have the same problem you had, though, having bought the mini tools and wishing now I had longer handles. I’m wondering about your friction-fit test. My instinct tells me that any ability of the tool to move in the handle will be exploited by the vibration of cutting action. But I might be completely wrong about that. Let us know how it goes. Sharon: A nice set of turning chisels. Great job on the build. Just a question from my own ignorance, what keeps the screw holding the cutter from coming lose during use? bob: good catch, the ferules will be put on once I finish the other 2 handles. kenn – friction. the cutting action/forces are inline with the shank of the screw and not perpendicular/sheared to it, so there isn’t much there to vibrate it out of position. They look nice Purp. Can any one make these with a bench grinder or do you need some special metal working tools? Great looking tools Purp. I had the same problem buying a mini set when I first started and moved up fast. Building my own turning tools gives me great pleasure now. I’ll be looking in the future to see how everything works out. Mauricio – while not the method I used, yes – you can use a bench or angle grinder to shape the metal. can also use a hack saw and files if you must. Update : Made some test cuts with the friction fit “rougher” and other 2. these cut fast! and produce a nice finish, however, unlike HSS gouges the entire action is a scraping action (not surprised – was a known characteristic) and just doesn’t feel as “zen” and as ‘fun’ as the slicing action and the curling shavings that come off of gouges. I use these kind of tools for inside turnings. I prefer conventional tools for outside use. papadan? nice to see you active again! This was my first experience with insert tooling, and for now I tend to agree with you in terms of ‘working’ preference. sorry to hear that. we all have our chains trying to keep us planted, some more tight than others. I hope you find improvement soon. Thats a pretty solid deal from Eddie. You can always make a wooden handle for it later to.